Slash-and-burn farming peoples in the Amazon Basin live on manioc (cassava), which is poisonous, using diverse tools to eliminate the poison. 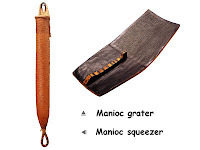 First peeling the manioc tuber, they usually grate it on a grater where numerous pointed pebbles are embedded. Then, they stuff the grated manioc into a cylindrical basket, and squeeze it. Finally, the manioc starch, from which the juice has been removed, is thinly spread over an earthen baking pan, baked on both sides, and eaten as bread.